Meanwhile, young Tavi of Calderon joins a newly formed legion under an assumed name even as the ruthless Kalare unites with the Canim, bestial enemies of the realm whose vast numbers spell certain doom for Alera. 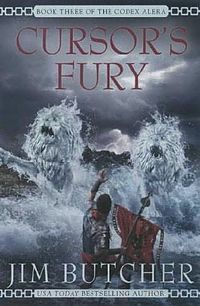 When treachery from within destroys the army’s command structure, Tavi finds himself leading an inexperienced, poorly equipped legion-the only force standing between the Canim horde and the war-torn realm. Tavi shows here that while he might have smarts from not having furies, he certainly hadn’t gained any sudden military intelligence. Luckily Tavi is returned with some friends who do have experience and can help him along. Stuck dealing with warriors that were known for being extremely tricky to kill and even harder to understand, Tavi finds himself having to use every weapon in his arsenal to find out exactly what is going on around him. Though there are some ups and downs in this mostly military style story, Butcher shows that treachery can be anywhere and anyone, and that warriors can never be too careful. Like the previous novels in the Codex Alera, you cannot help but want to know where everyone will end up in the end.